Realtors, Get Your Boats – Notorious R.O.B. Rob has been asking me to step into the Notorious ring for months. And while I have a lot of things to say, I don’t use nearly as many words as he, or Notorious S.A.M., or the other guest contributors. So. Many. Words. I moved to Houston in February, which is one of the pivotal moments of my life. Not because I had lived in Washington my entire life. Not because I was leaving the community I had been ingrained in for over 20 years. But because it made me an honorary Texan. If you don’t believe me, I’ll show you my mug. H/T to Jennifer Archambeault. I travel a lot for work. I spend far more nights in hotel rooms than I would like. But I’ve never seen anything like what I have seen from Texans during my short tenure in the Lone Star state. There is a sense of pride and humble gratitude. There is a strength of character. There is common courtesy that has been lost in so many other places. I have felt a profound sense of helplessness since Thursday, August 24th when I landed in Denver. I haven’t been able to get home since. What was supposed to be a quick overnight trip has turned into 10 days and counting. Away from my home. Away from my dog. Away from my new community. All I can do is watch and wait and pray. I am humbled by my new community. People have been coming together to help each other. We’ve all seen it on the news. The horror is not over; but the transformational healing process has started. And it started with some of the most unexpected heroes. It’s not the folks in charge that I’m talking about when I speak of heroes. It’s the folks coming from across the country with cargo trucks full of food and supplies. 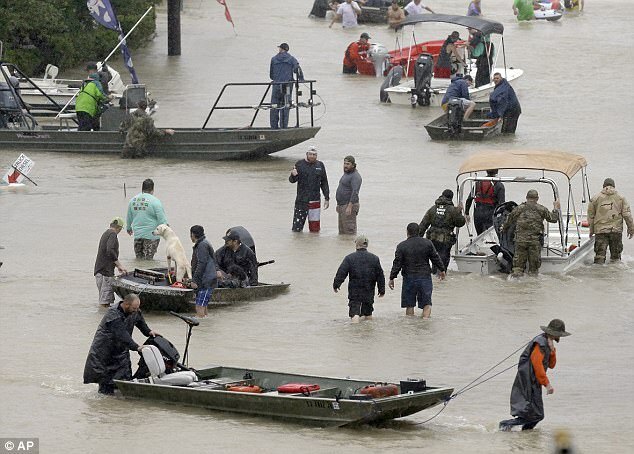 It’s the strangers in fishing boats rescuing those who can’t rescue themselves (including animals), the most famous of whom is the Cajun Navy but includes hundreds of unnamed and unsung people who have done the same. It’s the furniture store owner opening the doors of his showrooms to people who have lost everything, so they can feel a little comfort in the most uncomfortable and uncertain of times. Yes, the leaders at the local, state and Federal levels have all done their jobs. They worked tirelessly, made decisions that none of us want to have to make, showed up taking responsibility when things didn’t go as planned or the public didn’t understand the reasoning. But it is the everyday heroes who inspire us. We are all seeing just a small percentage of those people on the news and social media. But we are feeling the impact of all of them. I’m proud to be an honorary Texan. And as soon as I’m able to get home, I’m ready to roll up my sleeves and help however I can. In addition to being a Texan, I am a real estate nerd and industry lover. And I have been feeling utterly helpless for the past 13 years, as I watch the industry I love destroy itself. If everyday Texans can come together in a time of crisis to help heal the lives of those around them, can’t the everyday Realtor do the same to help heal the organization and industry? I’m not talking about NAR staff or elected leaders. I’m talking about ‘boots-on-the-ground, feeding-their-families, building-communities’ everyday Realtors. I think that the majority of the over a million Realtors are these folks. They’re not the ones who get the recognition and the glory. They’re not Madam President or Mr. Chairman or Director of anything. They’re the ones that practice real estate as their chosen profession, without the need for outside recognition or the desire to push a political agenda. NAR leadership and staff have work to do, just as the elected leaders across Texas did: make the tough calls, be held accountable, and stand up for the decisions and direction of the organization. But these people aren’t going to be the movement that heals the Realtor organization — not by a longshot. I’m sure a lot of people reading this will say “The everyday folks aren’t true Realtors. They don’t feel the need to get involved. They’re unprofessional and untrained.” Trust me, Rob says this right here on Notorious, as well as on stages across the country. But some of those same naysayers, including Rob, might not have thought that random guys would risk their lives, boats, and trucks for strangers. They might not have imagined that average people would get involved to the extent in which they have and become heroes. I’m not saying that every Realtor has the best interests of the public and community at heart; but I believe that a majority are good people. Just like I think that a majority of people on this planet have good intentions. Maybe I’m naive. But I don’t think so. And thousands of Texans are proving me right day after day. So only 15% of members respond to NAR Calls to Action. Maybe it’s because the rest feel disenfranchised from an organization that has been run by political agendas instead of the original core values — an organization that has lost its way. Maybe they feel like their voice doesn’t matter because only the chosen few hold all of the power. Or maybe the other 85% don’t know that it’s raining because they are so busy serving their clients, taking care of their families, and trying to balance it all that they haven’t slowed down long enough to feel the rain. I think the everyday Realtor is more powerful than she might understand, and certainly more powerful than she is often given credit for. I believe that she will rise to the occasion in times of crisis. Instead of waiting for leadership to fix the problem of professionalism in the industry, go out and help your fellow Realtors by offering guidance and support. Don’t publicly shame them because they “Ask the wrong questions.” Words DO matter, but actions and character matter more. How are we supposed to heal a broken organization if we aren’t willing to treat each other with dignity and respect? Why should consumers treat us as trusted advisors when we stab each other in the back? Granted, there are some truly crappy agents out there that don’t care about their clients or the industry. They don’t know the contracts. They put their needs above their fiduciary duties to their clients. They see people as leads. Those people need to go. But those people aren’t the majority. Realtors, drive your truck full of supplies to those who don’t have the resources that you do. We know that all brokerages are not created equal, and some leaders make better mentors. But that doesn’t make the Realtor under that leadership less worthy or less professional. Use these moments as opportunities to serve one another and provide a better experience for everyone involved. Don’t wait for NAR to rescue ‘the others’ while you sit comfortably high and dry. I am a recovering broker; and as one person, I did the best I could to serve the agents in my office. But as one person, I fell short at times. I acknowledge my limitations and take responsibility for them. But I didn’t wait for the Realtor organization to solve my problems. And frankly, I don’t think it can or will. Just like the leaders in Texas couldn’t save every devastated community. We have to save each other. We have to serve each other. So to all of the NAR leadership, both paid and volunteer, keep doing what you do. And to all of the Realtors doing it to provide a living for their families and create vibrant communities, get your boats. We have work to do. NextNext post:Show Me The Money! Thank you, Jay!! I know it’s been hard for you to watch your home state go through all of this. Thank you, Victor. I appreciate it! Wow–so well written, Sunny. Thanks for your inspiration. That means the world to me coming from you, Sam. Now put down your conference chicken ;), and get your boat!! This post might well serve double duty. Read it a second time and substitute US Congress for NAR and Voters for Realtors. Recovering broker, nice. Well written, and great points. Of course you know I think we need more repair and less bandaid. If I see a flaw – those in Houston know they need help, and are thrilled to receive. How do we convince those who need help, they have the need? Exactly Greg. Those with subpar skills may not even recognize the fact they need help. How do you fix this? I have no clue. Greg, these are the people that don’t even understand that it’s raining. With so many headcount shop brokerages (just like NAR, IMO), it’s hard to find the right solution. Maybe we all need to come together and vote with our dollars – stop supporting NAR until they take this issue seriously. Again, I don’t have a complete solution. But action is the first step. As a TEXAN myself I am proud to call you an Honorary Texan! Your words are very inspiring and true. As I watch both my birthplace city (Houston) and my hometown (Beaumont/Port Neches) drown I feel helpless that I cannot be there physically, but even from CA I can and have done so much to help within the means I am capable of providing. My friends, classmates and family who have lost everything they own are simply grateful they survived so they can help those around them. Thank you Sunny for this message and I stand with you as a 15 year veteran in this industry. The Realtor brand has no more meaning to most of the members, as well as consumers. I hope this can change. But I’m not certain it can be saved at this point. We are stronger than we know sometimes!! I originally got into real estate for all the wrong reasons: I was an IT pro, dating a lovely woman who owned her own small brokerage and she wanted my business IT expertise as a means to better serve her clients and to grow her business. Circa 1991. After a few months, she suggested that I get a license so that I could engage clients across the full spectrum without hitting any legal blocks. Well, damn, it took all of 60-hours of classroom and then passing a couple of trivial tests and sending lots of money to NAR and all it’s lesser organizations and I’m a proud REALTOR. The RE biz now has 2M+ licensed agents and 1.2M+ Realtors in a new world where buyers do 80% of their own searches online while listing agents have awesome tools to quickly determine “market value.” This means I can make $10k with even fewer hours of work. Nice! So, what exactly do full time agents do with their 50-60 hours/week? Trolling for leads. Working on leads. Tracking potential leads. Buying hundreds of leads to discover the 3% that will eventually buy/sell. When their are only 5M properties changing hands annually, the average number of transactions per licensed agent yields the ridiculous number: 5. We KNOW that we have two distinct tiers of agents: The Top-20% of really good/effective/engaged agents and the Bottom-80%. Those Top-20% also only spend 10-25 hours per transaction, if that. Which yields at least $100/hour and often $500/hour — for a person with 60-hours of education who could pass a 8th grade test. Given these horrific numbers that the general public has some faint notion of, is it any wonder that we consistently rank near the bottom in “Public Trust?” I think not. We ALL know that there should be some sort of designation/marking so that the public can distinguish between the newbie with few (if any) transactions, the “intermediate level” agent with lots of transactions but few in the past year+, and the full time professional/successful agent who is doing 10+ transactions per year, every year. Or something like that. So, when “the real estate industry” focuses on a more transparent and fair system for its clients, perhaps we’ll get the two things we want most: Respect from the public; and Respect amongst ourselves. Everything else IMHO is self-serving BS. I agree – the Realtor brand is meaningless because it offers no differentiation. And NAR isn’t doing anything to fix this – especially not throwing $38M a year at a consumer marketing campaign. NAR is broken. I’m in favor of starting over. Lots of people still think it can be saved. I haven’t completely thrown in the towel, but a simple reboot won’t work. We need to wipe the hard drive. Spot on Sunny. Thanks for putting into words what a lot of people have been thinking. All the best! Thank you, Tom – I appreciate it!! Thank you, for your insights. I’m Broker and professional property manager. I’m a member of NAR, Florida Realtor and ORRA. This is the last year I’m a major Donor to RPAC. I find there is the same cast of characters at All who recycle and give awards to each other. I feel none of these organizations represent me or my industry. The agents and Brokers and not client focused. Commission focused. The Golden goose was shot in the head long time ago. When money is the focus, we have lost our way. And I agree that money has been the focus of NAR, as well as some brokerages and agents. Not ALL brokerages and agents are focused on the paycheck – there are some that truly put their clients and communities first. So for those people, I really do hope that the industry can turn around. I read an article a while back. I hate it and love it at the same time. I hate it because a member of John Q Public basically spells out in black and white, with reasons why, he has no use for a real estate agent. I love the article because it takes me one step further into solving the real estate riddle. I believe that the services we once had and held proprietary (The mls. We built it. We have the right to guard our intellectual property and profit from it.) are no longer there. Time and technology have eroded the need for people to engage the services of a real estate agent. There are less reasons for someone to engage a real estate agent today than there were 10 years ago. Maybe we did lose our way, but we haven’t become more evil from 10 years ago. In fact I believe that we missed a few critical turns about 5-7 years ago. We didn’t gaurd our intellectual property and instead spewed all of it’s contents onto Zillow. We gave Zillow advertising dollars and content, and we let them grow into a beast. The content and money allowed Zillow to grow into a public MLS that is now able to sustain itself from contibutions from the public. We’re in competition with each other so the notion of us helping each other in any way that changes us at the core level is out the window. Not gonna happen. I don’t believe Sony, Samsung, and Visio help each other in the fashion portrayed in this post. I don’t think AT&T, Verizon, and Sprint are helping each other much either. What I offer as a revision to helping each other is a collaboration. We need another major collaboration that is intuitive, wanted, and proprietary. We need another collaboration on the level that the mls once was. We need a product or service that is wanted by consumers and belongs to us. Isn’t that how supply and demand works? Let’s collaborate and create the next best thing that the consumer needs and is willing to engage our services in order to get. What will this be? If I knew I would be inventing it right now instead of writing this post. I recently heard you speak to a group of REALTORS (very impressed BTW) where you talked about a REALTOR shaming another REALTOR publicly on Facebook. And you urged us to help our fellow REALTOR instead of going negative and hurting our profession. WE are the brand you said. And then a REALTOR in the audience raised her hand and talked about how she had a similar situation with another REALTOR and instead of shaming or ridiculing – she did what you suggest and helped the other agent. She coached her. And today that agent is a better agent and the two of them are very close. I guess I’m sharing that story to support you and what you envision for our industry, and to encourage us all to heed your words. We can each do our part as you say. Thank you for your post. For your work in our industry. For your travel to speak to us all. And for urging us all to do better. Well said sunny. I enjoyed the whole article. Couldn’t agree more. Looking forward to seeing what the KW crew does with their change of direction this week towards the relief efforts. I applaud all of you for the work and support – it’s incredible. Let’s see if we can work together to create a movement to overhaul the industry and NAR. That could be amazing.